These are seconds but in excellent shape. My idea was to make peach chutney which I have purchased and loved. I read recipes and more recipes, for weeks, decided on one that got great reviews, and proceeded to do that, make the chutney on Sunday. Well after cooking down for 4 hours, and still only half way there, on top of adding too much vinegar (followed the recipe..but way too much), I ended up water bathing it any way. They say that chutney will age for about 3-6 months and the vinegar will mellow. I hope so, I hate to think I wasted a whole lug of peaches on something I won’t enjoy eating. So I also have been experimenting a bit lately with using my new food processor to make doughs. I made a great rustic dough a few weeks back for the raspberry tart. Yesterday I finally tried my hand at my first ever pie crust. Again read and read and followed the directions, but one thing is certain here, skill comes from practice and I need a lot of that! 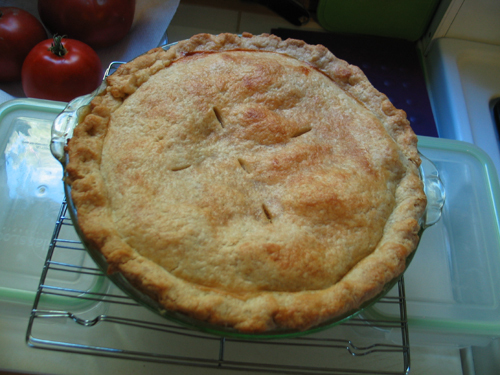 I did manage to get a pie crust rolled out and made a peach pie. Haven’t eaten it yet, so no verdict on the crust’s taste or tenderness.. will update when it has cooled enough. I still have half a lug of peaches, maybe I will make some cobbler, crisp, or a rustic tart later in the week. That is a pretty impressive pie crust for your first effort! If I recall, mine was a thick patchwork of grey paste.